Block Chain Gang LLC, Crypto Cowboy, Something Something Blockchain LLC: Based on the names of dozens of new companies registering to set up shop in Wyoming, the state's effort to lure the latest tech craze appears to be paying off. Proponents say blockchain—the ledger where transactions of digital currencies, like bitcoin, are recorded—could be the kick in the pants Wyoming needs to attract tech businesses and diversify its economy beyond fossil fuels. Another allows businesses incorporated in Wyoming to use blockchain for record-keeping, promising easier and more accurate files on transactions and shareholders. The other two facilitate cryptocurrency trading and exempt cryptocurrency from property tax—a measure more symbolic than anything because Wyoming doesn't have property taxes. The stakes are high as Wyoming struggles with low prices for oil and natural gas and weak demand for coal. The fossil fuels account for 20 percent of Wyoming's economy, more than any other state, and the industry's recent weakness has saddled the state with a $500 million deficit. One potential problem in Wyoming: Under the U.S. Constitution's supremacy clause, blockchain tokens sooner or later are likely to be regulated by federal law and the U.S. Securities and Exchange Commission, which take precedence over state securities laws and regulations. "It's taking a sort of pro-business stance, which is great in some respects," Clyde Tinnen, a blockchain attorney with the Withers Bergman law firm in New York, said of the state incentives. "The tricky part is that as a result of the supremacy clause, it may not be as beneficial as they hope." In February, SEC Chairman Jay Clayton told a U.S. Senate committee that in his opinion, blockchain tokens issued to launch a company during what's called an initial coin offering in most cases appear to qualify as securities. "It will primarily be an educational effort initially. It will shift into improving cybersecurity, and then we'll start exploring actual use cases," Coyne said. "Ultimately we think the real value will be in the collection and distribution of municipal revenues." Coyne works from home on the Wyoming plains near the Nebraska and Colorado lines. He's no fan of "some of the craziness we see in the cryptocurrency world right now," including the hype and speculation surrounding Bitcoin. But so far at least, bitcoin miners are setting up in Montana, not Wyoming. And Cheyenne has a long way to go to catch up to the Rocky Mountain region's undisputed tech capital, Denver, where the economy is booming and construction cranes bristle the skyline. 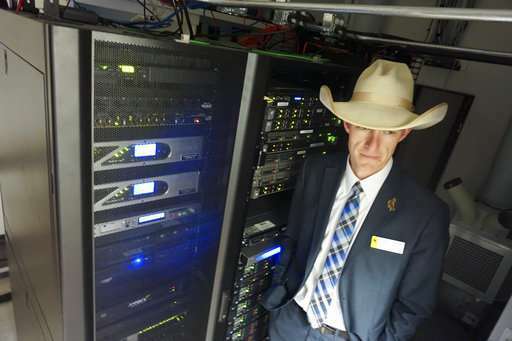 A few bitcoin miners have asked about Wyoming's new blockchain laws, but nothing major has come of the legislation just yet, said Ron Gullberg, business development director for the Wyoming Business Council, the state's economic development agency. "There could be opportunities for developers to come to Wyoming. So we're doing a lot of research and a lot networking and studying up on it," Gullberg said. "The thing that I'm excited about is that Wyoming is willing to jump in and experiment, knowing full well we have a great deal of additional work to do," said Coyne. "That includes appropriate regulation."